Photograph of August Olson from Monroe, Washington, dressed as Mr. Skygack in May 1912. Last week, a Racked article called “Meet the Woman Who Invented Cosplay” did the rounds (including on this site!). It argued that sci-fi pioneer Myrtle R. Douglas invented cosplay in the 1930s. It’s an interesting story, but the truth is a little older. The story’s heart is in the right place! As it primarily focuses, Douglas is a legend who deserves far more credit than she has received for the role she played in the development of cosplay, nerd conventions like Worldcon and science-fiction media as a whole. But by attending Worldcon in 1939 in costume alongside her partner (and fellow sci-fi pioneer) Douglas Ackerman, she did not invent cosplay. She just helped it along. It’s tough to pin an exact start date on cosplay. The word itself was only invented in the 1980s. Before that, what we now know and define as cosplay—the act of a fan dressing up as a fictional character from popular culture—was part of the wider (and older) scene known as costuming, which itself then bleeds into everything from fancy dress parties to Halloween costumes. But we can still go back through historical records and find examples of people cosplaying well before the first Worldcon in 1939, which has long been assumed by many to be cosplay’s ground zero (it’s actually the popular birthplace of cosplay conventions, not cosplay itself). For example, there are reports that in April 1876, the family of sci-fi author Jules Verne hosted a masked ball. Over 300 guests attended dressed as characters from Verne’s books. That fits some of the criteria of what we call cosplay, but since it was a themed party, and not the result of expressive fandom, we can’t conclusively call it the world’s first recorded act of cosplay. Fast forward a few decades to the early 20th century, though, and we definitely have records of people cosplaying. The Spokane Press, December 19, 1908. The Fells were a pioneering cosplay couple. In 1907, cartoonist A. D. Condo began work on Mr. Skygack, from Mars, the tale of an alien visitor who lands on Earth, rents an apartment and makes observations/jokes about all the bizarre human behaviour he sees. 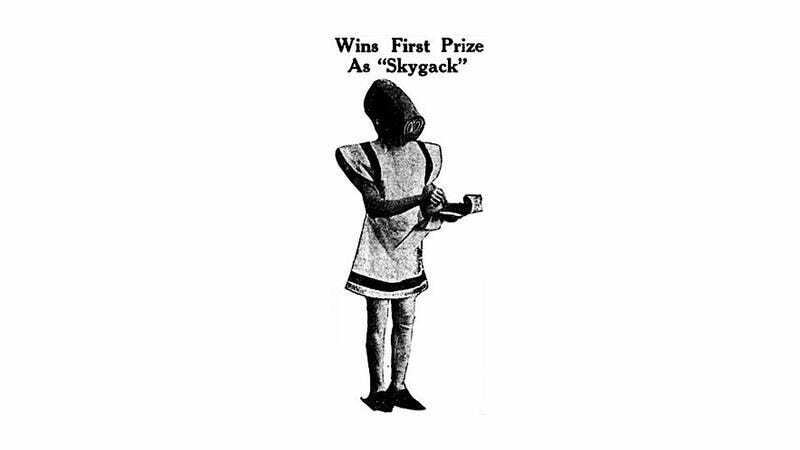 Mr. Skygack’s syndicated adventures appeared in newspapers all over America. Considered the world’s first sci-fi comic, it quickly earned a legion of dedicated fans wherever it was in circulation, and helped inspire America’s first generation of recorded cosplayers. The March 8, 1910 issue of the Tacoma Times has a report on James’ arrest. This wasn’t the last time a Mr. Skygack cosplayer would make the papers, either. In March 1910, a woman in Tacoma, Washington, took first prize at a masquerade ball dressed as her favourite comic character: the alien anthropologist. The woman’s unusual costume had been a hit with locals and, seeking to drum up a little interest in his business, her friend Otto James borrowed the suit and proceeded to walk up and down a busy Tacoma street wearing it, reportedly to advertise his ice skating rink. Despite the costume’s success at the ball, the people – and police – of 1910 weren’t quite ready for cosplay to go public just yet: James was arrested on charges of public masquerading, before being released on $10 bail. These two examples—and a third from 1912, pictured at the top of this article—are all textbook examples of cosplay: fans of fictional characters have created a costume based on that character’s likeness then worn it. So were Mr & Mrs Fell the world’s first cosplayers? As I explained above, it’s very difficult to say. They’re certainly two of the earliest recorded examples of what we’d now call cosplay, but given the practice’s murky past and our reliance on historical record for absolute proof, we can’t say for sure. What we do know, though, is that Mr. Skygack’s fans were part of the first wave of what we now know as fandom. Living through the development of new mediums like national newspapers, comic books and film, as well as a growing popularity of fantasy and sci-fi stories, they were part of a generation of people who weren’t just being swept away by imaginary tales, but could for the first time ever see what their favourite fictional characters actually looked like. Able to experience more from their stories, and exposed to more of them through things like weekly broadcasts and syndication, it was only a matter of time before some of these fans became fanatics, and moved beyond simply consuming media into something more...obsessive. Like dressing up. The 1939 Worldcon became famous because two of its guests—Douglas and Ackerman—turned up in science fiction costumes (both of which, incidentally, Douglas had made). They were the only two. A year later, in 1940, enough people had been inspired by their move that Worldcon held an impromptu costume competition. It’s from those two shows that cosplay conventions can trace their direct lineage. So Douglas did indeed play a role in the development of cosplay, as conventions like the one she helped popularise proved an invaluable way for pre-internet fans to meet other cosplayers, compare notes, improve their craft and showcase their talents. But Worldcon didn’t invent cosplay itself. That honour goes to pioneers like the Fells, poor Otto James and countless others who were brave enough to take the plunge and dress up, but never have their efforts make the local newspaper. PLUG: Much of this is taken from the introduction to the book Cosplay World, which me and Brian wrote a couple of years ago. You can get it below.